Picture this: Cuppie throws a really sweet soiree that has all of the other baked goods buzzing. 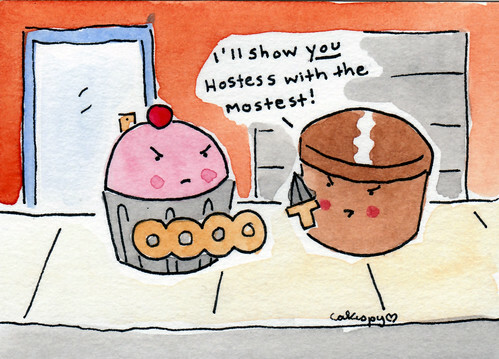 But it looks like another pint-sized cake feels like Cuppie is invading its territory! And so, for this week's Illustration Friday theme of Idle, I present the inevitable faceoff: and based on the weapons of shankery and destruction they're toting, I'd say this is no idle threat.